Can you believe that these pictures were taken on a winter day (thanks to abnormally warm weather)? Something is definitely going on with the global climate, don't you think? С трудом верится, что эти фотографии были сделаны посреди зимы. Наверное, с глобальным климатом всё-таки что-то творится, вам не кажется? Really gorgeous photos. The weather looks blissful, I wish we'd get some days like that here. It's just been a typical english winter though instead, rain, rain, rain! The skirt is lovely, I love the look of movement of it! Absolutely beautiful and gracious photos! I love seeing you in red! Very stunning combo. Hi!! !ohhh i love long skirts! !i really love these pictures and outfit is so perfect!!! you are gorgeous! love this look and photos! These pics are so beautiful! Gorgeous skirt. This is the perfect outfit for this kind of weather that we are experiencing. lovely outfit! 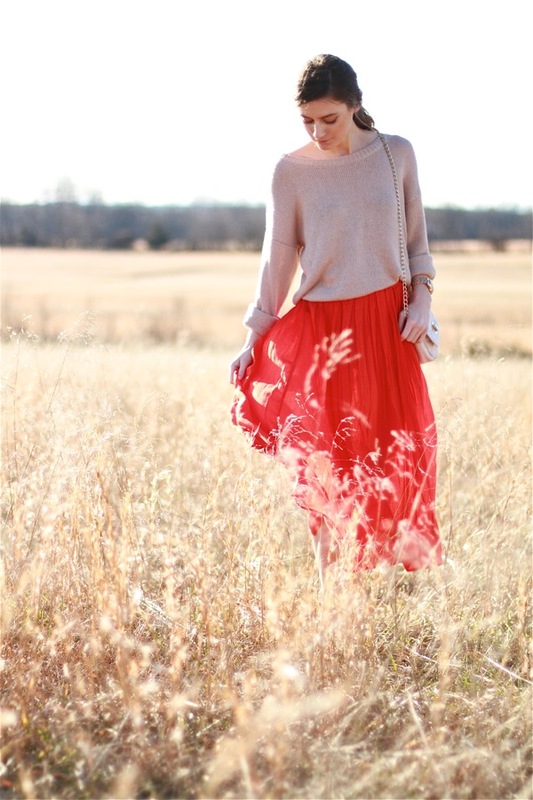 the poppy maxi skirt is so pretty! Beaituful colours!That is definitely global climing! COral+whit colours are so so good together! wonderful photos! it looks great in these fields, particularly with the red skirt! I wish we had a winter like that! It's currently -10°C here! Wow! You look beautiful as always. love that skirt! Sooo gorgeous. Wow, that SKIRT. And BAG. WOW! Love your blog. oh i love the skirt! the color on you makes you blush! I love it! You look sooo beautiful! love everything you're wearing! such a Great post ♥ I love the skirt! 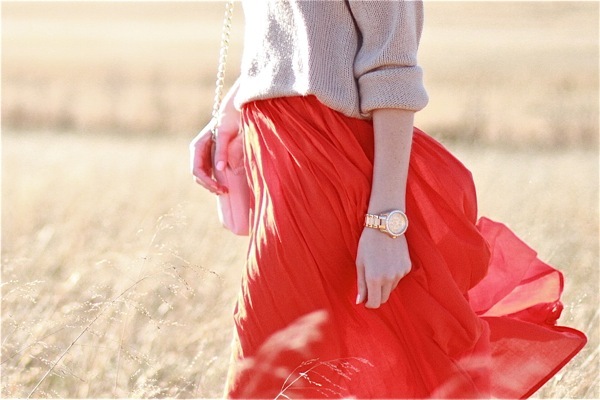 I love the contrast between the sweater and the field and he red skirt, it's beautiful! Gorgoeus look! This skirt is so very beautiful! And the cream sweater completes the outfit perfectly! So nice, love the color combination of this look, so chic & sweet. definitely, something's wrong with the weather! it's super hot in here D: i'm not enjoying my winter at all! Owh My! I'm so jealous. I wish there was here some sun. Though, I love the look. Especially your skirt. You're so beautiful! I love that skirt!